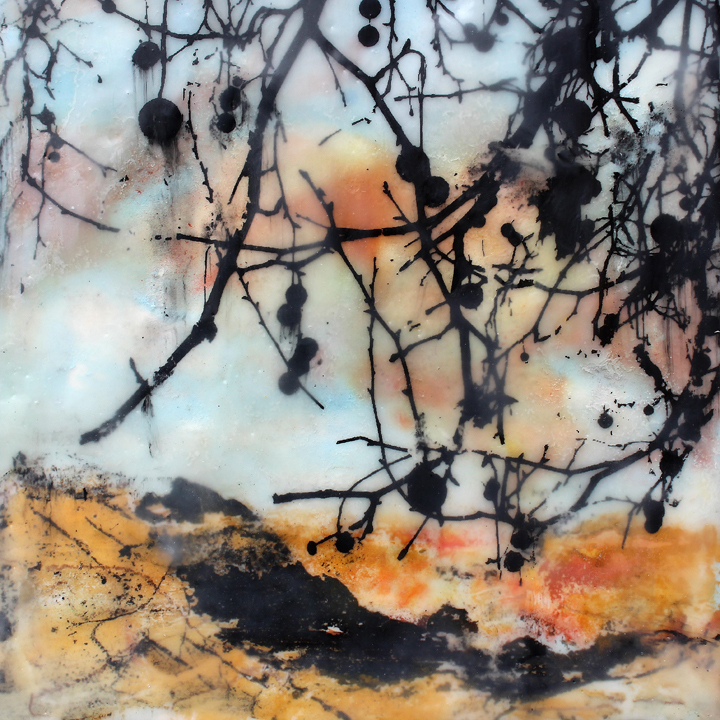 Encaustic is very versatile way of painting, using a mixture of wax and resin applied in layers. Images can be process driven – for instance, using printed marks and images - or more painterly, where the image develops in a more organic way. There are infinite combinations you can make with very little, or you can make the whole process much more complicated. 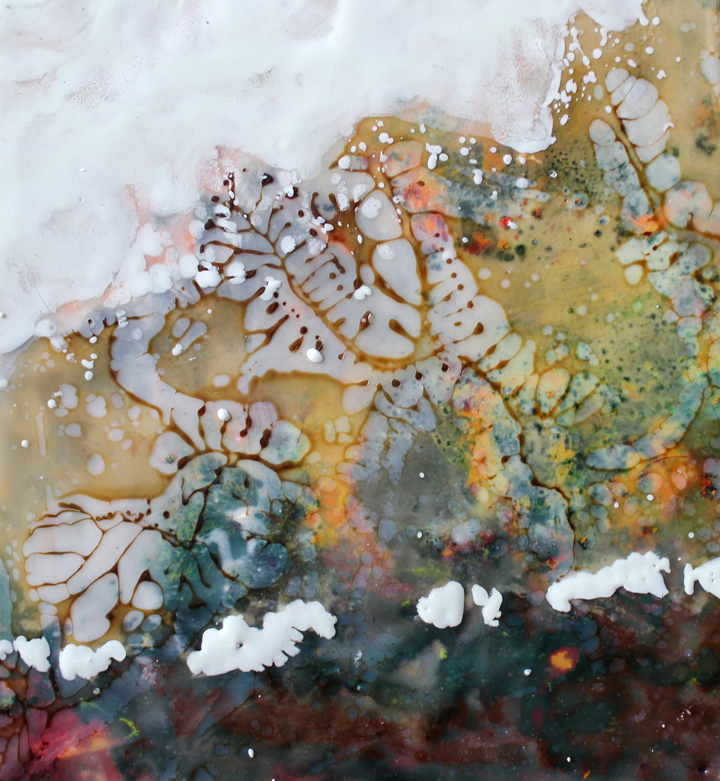 I started using encaustic when I was at Coventry University doing a BA in Fine Art and exploring methods and materials for my work on fossils. Wax areas can be used in oil paintings, by building the surface up and sculpting or creating textures. 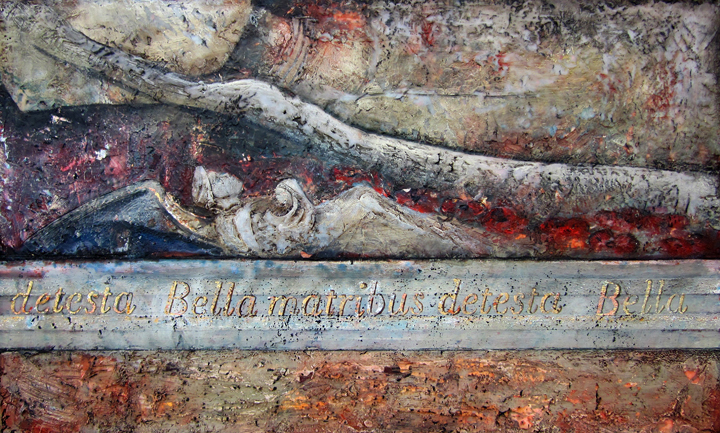 I still use wax on a series of large paintings of walls and crumbling facades that I am painting now. 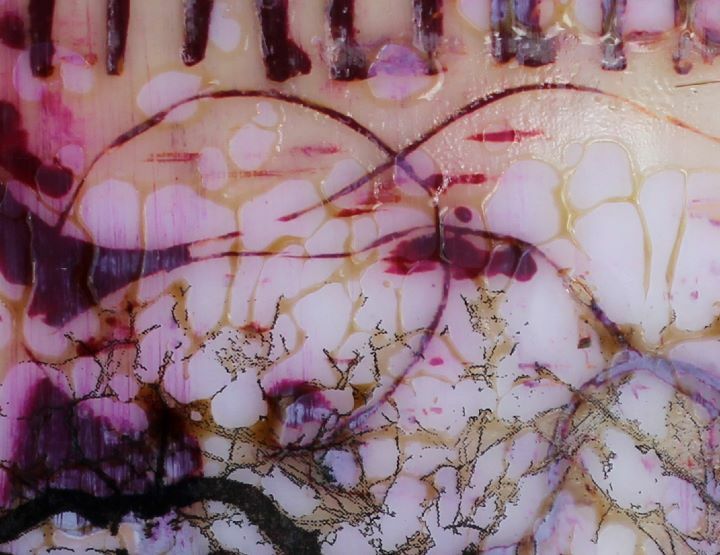 You can make paintings that made almost entirely from encaustic wax and pigments, combining them with oil pastels, collage and various techniques to make each one unique. I use a batik pot with a thermostat to melt my wax now, but for years I used an ordinary double-boiler or a bain-marie on a two-ring table top hob. You can also use cheap slow-cookers, but these take a long time to melt the wax. I also use a camping grill with a thermostat to melt my blocks of coloured wax. I have a collection of tools to incise the surface with lines – you can get some good sugarcraft and clay tools for this purpose. 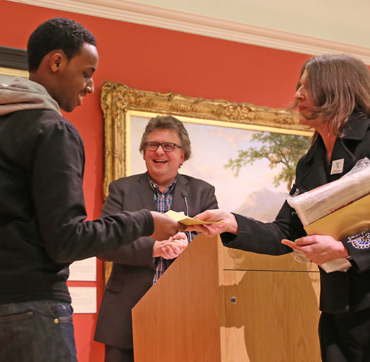 You have to start with a substrate – an absorbent card, stretched watercolour paper, or plywood. Anything that has a robust, absorbent surface is good. Canvas can also be used but you need to be careful to use a very good quality absorbent primer. 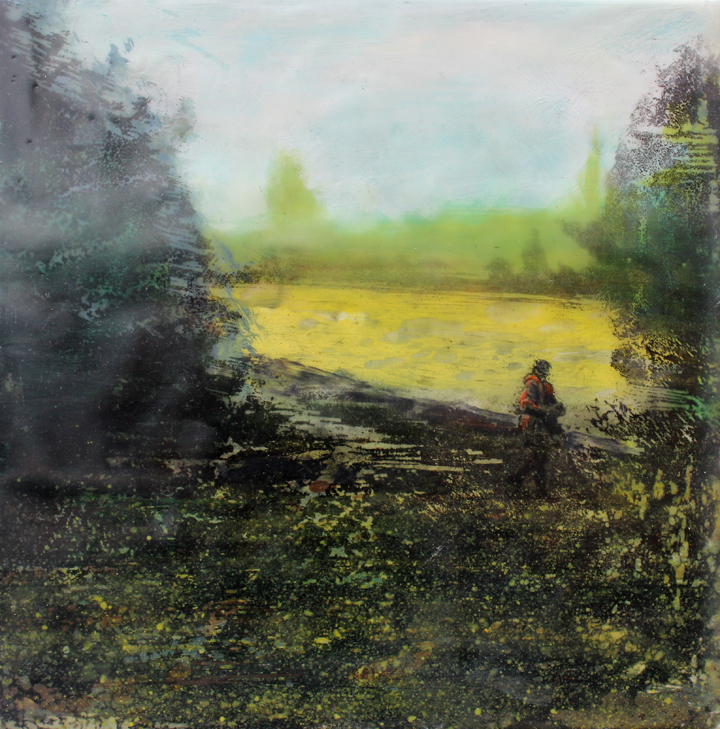 The ‘painting medium’ I use for my encaustic works is usually a combination of microcrystalline wax and Damar resin in the proportions of around one-quarter resin to wax- occasionally I may use beeswax instead. Firstly I heat the wax – you need to keep the area well ventilated to avoid the fumes – to its melting point (microcrystaline melts at 67%). Once the Damar resin is added to the melted wax it needs to be stirred intermittently until it has completely melted- this takes a while as damar has a higher melting point. The melted medium then needs to sieved (I use a piece of scrim) to remove any particulates originating from the resin. Pour the painting medium into a mould – an ordinary baking tray lined with parchment is fine- and before it is cold, cut it into chunks. 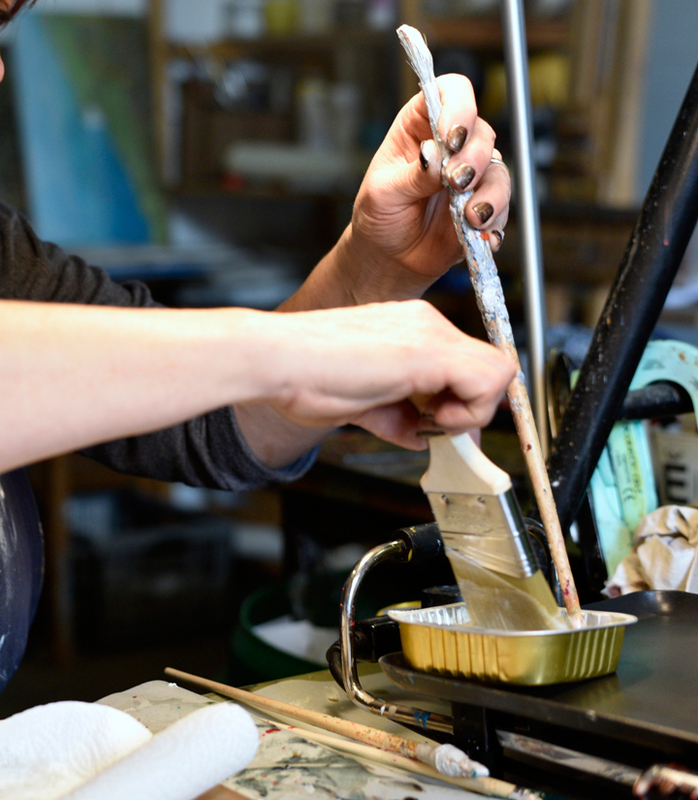 Encaustic painting is done best when the weather is not too cold so the ambient temperature doesn’t cool the wax down as you are using it. 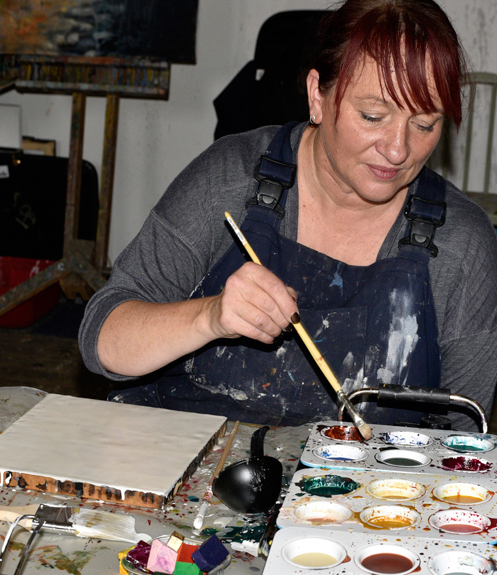 When you are ready to paint, gently reheat a lump of the painting medium. First, warm the surface of your substrate with your heat gun so the wax doesn’t set on impact, then use a flat natural hair brush like a hake to swiftly spread the wax over the substrate. 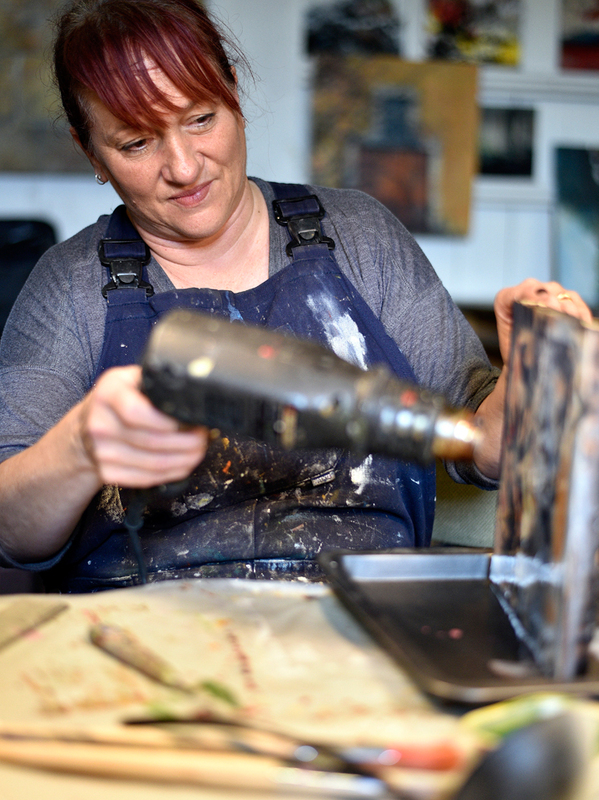 You need to make 2-3 layers of wax to start the encaustic painting, and before you add each layer wave the heat gun or blow torch to slightly melt (fuse) the surface and get a really good bond between layers. If you are working with coloured wax blocks, the next stage is to melt your pigments. 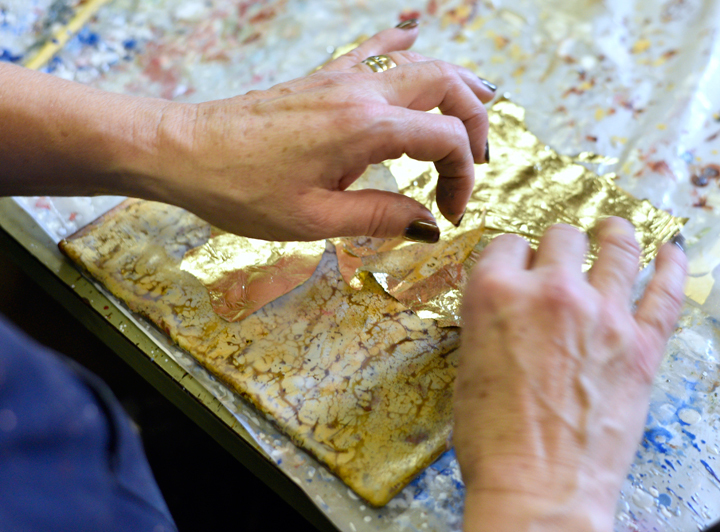 ‘Fusing’ is an essential part of the encaustic process- it ensures there is a bond between each layer of wax. 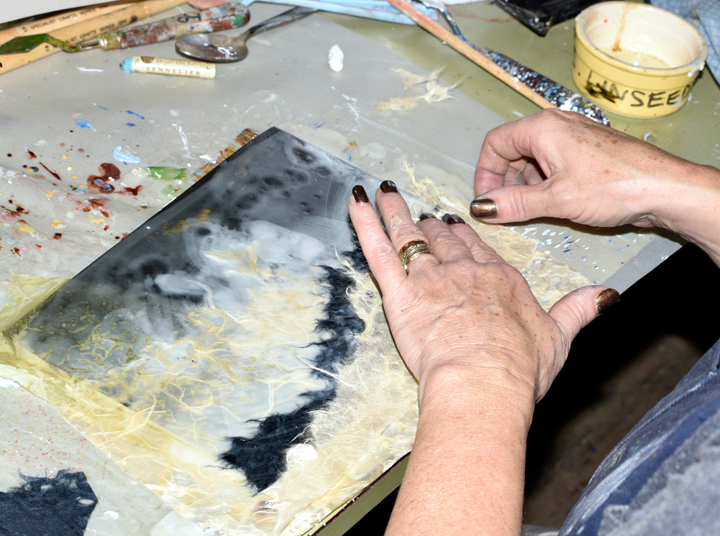 Remember every time you lay down colour you must apply heat to make sure there is proper fusing between layers. You have to wait just for the surface to look shiny, then move the blow torch or heat gun on. Alternatively, you can use an embossing gun to fuse oil pastels; this has a gentler heat and is less likely to disperse the pigment. 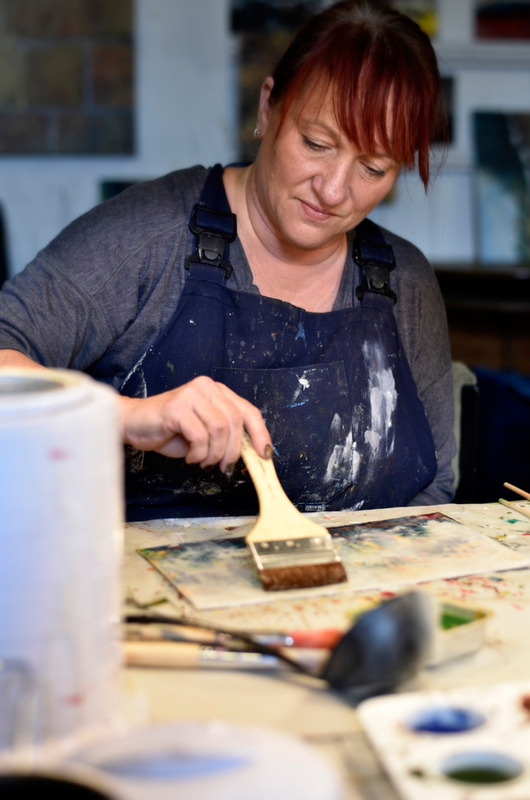 You can use encaustic wax cakes, oils, paint sticks, dry pigments, chalk pastels or oil pastels, depending on the required effect. Oil Bars work better than oil paint because they contain less linseed oil- if you would like to use oil paint, squeeze the paint onto kitchen towel and leave it overnight to absorb the excess oil. When mixing my own colours I use around 80% wax to 20% pigment - this give a nice, hard finish. I use Sennelier oil pastels – when these are fused onto the surface you get interesting results by the colour becoming more saturated. Pan Pastels work well and come in a lovely range of different colours. Each one isn’t cheap, but they do last a long time. I apply these with makeup sponges, and fuse each colour between layers. The surface can be coated with a mixture of shellac and immediately set alight to create curious organic patterns know as shellac burn. After the burn, allow the shellac to dry overnight before adding any more layers. 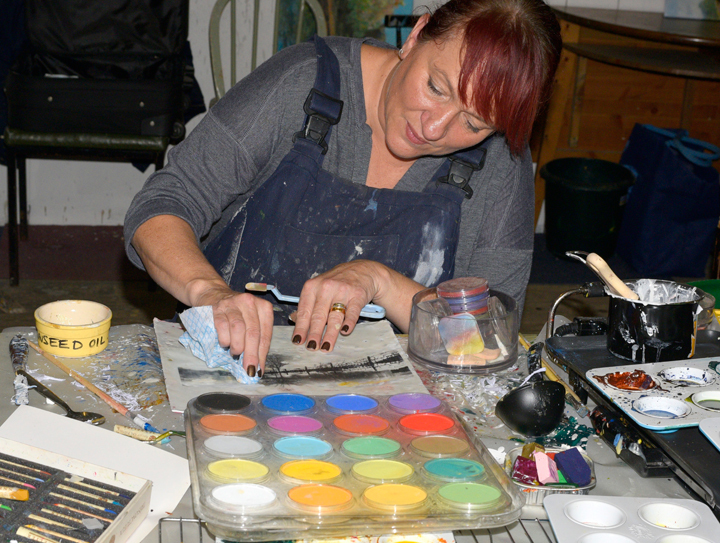 There a lot of different approaches you can use in encaustic painting as you gradually build up the layers. I enjoy building up layers in a sculptural process. 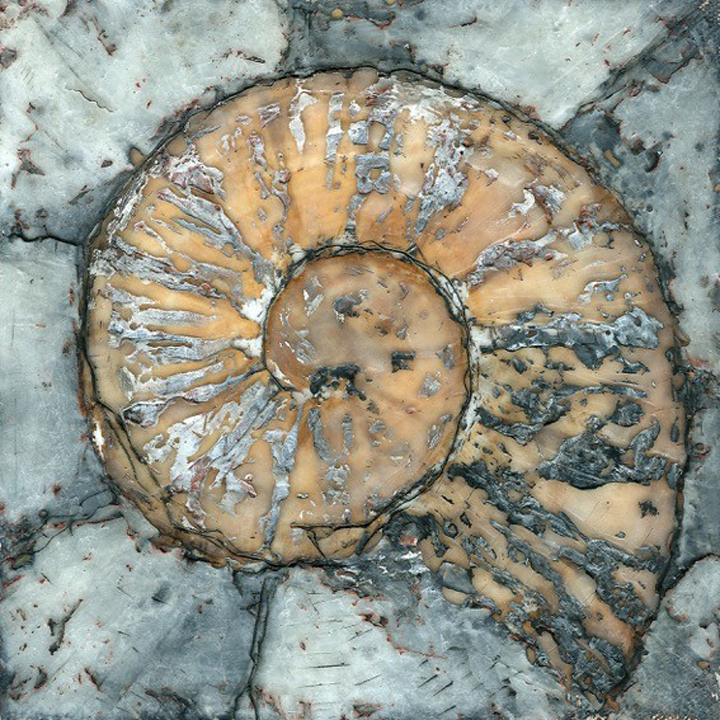 I used this for my fossil paintings for rock and in the tomb of 'Bella Matribus' to give an illusion of stone. 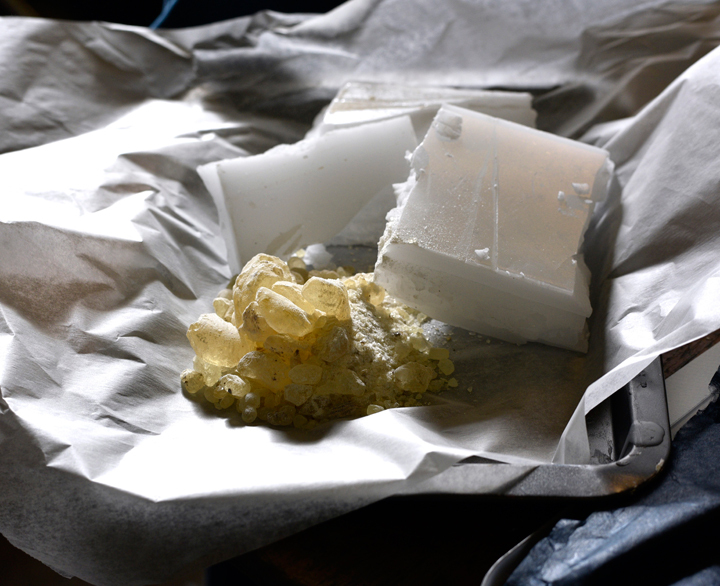 I pour on some heated wax and it cools it becomes malleable and it can be moulded and modelled with a palette knife. 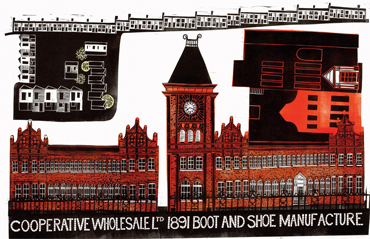 You can inlay flat objects for pattern and texture – fabric, coloured papers and collage them into the encaustic layer. Putting them on a light ground enhances the effect. You need a couple of layers of clear wax fused over the top to protect them. You can also impress items with a texture into the wax – combs, string, or scrape it with scalpels, but the wax must be warm, not hot. 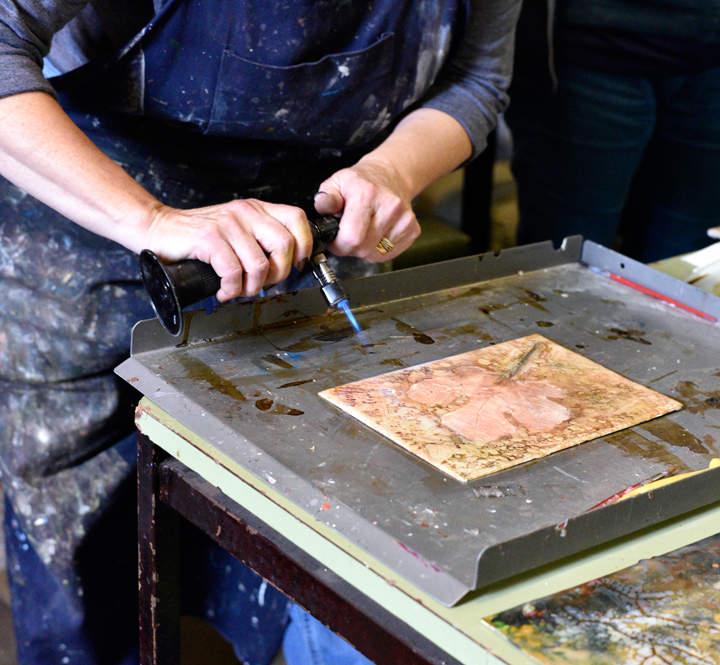 It’s also possible to use subtractive process and scrape back through the layers – it helps if the wax is not completely cold. 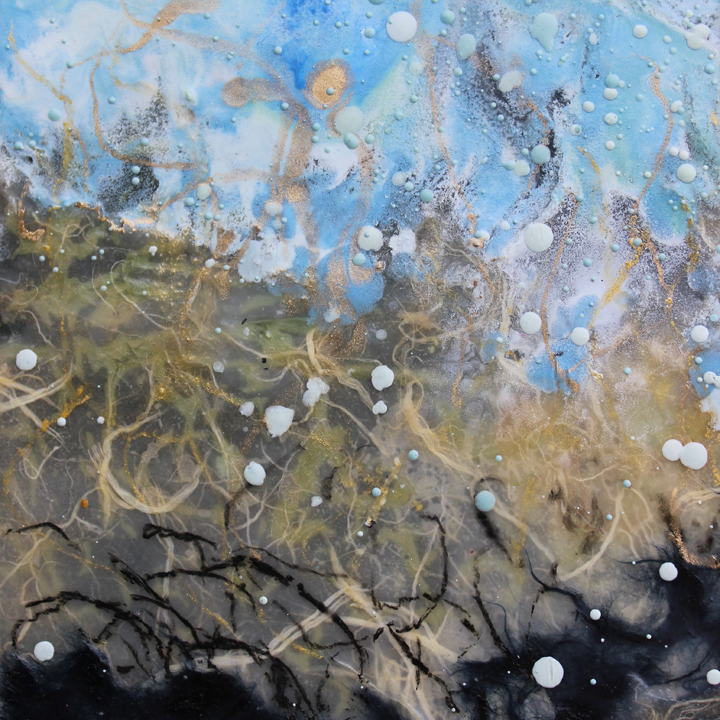 One of my favourite ways of working is flicking and splattering coloured wax across the surface. The image must be recently been printed off a laserjet printer on thin paper – and it must be laserjet; inkjet will not work. 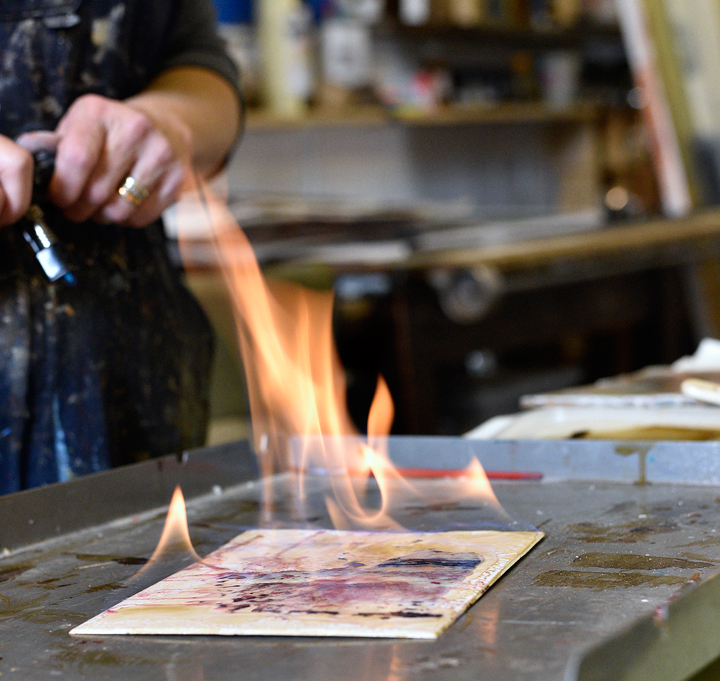 Place the image face down onto the warm wax, then burnish with your fingers to push the printed image into the wax. Spray the back of the paper, still face down, with water, then rub away the paper fibre with your fingers until it all comes off. 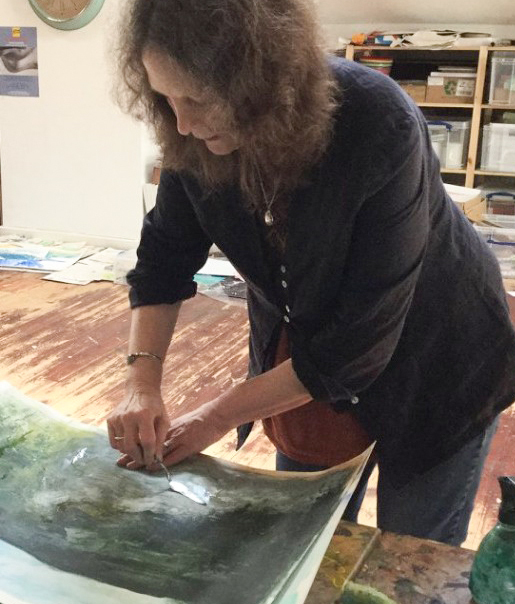 You can incorporate drawing marks into the painting by drawing on thin tissue paper and coat it with wax to seal it- the paper will become transparent. Alternatively, you can draw on the back of tracing paper with soft graphite or charcoal and burnish the drawing onto the surface by rubbing the back of the paper with a spoon. Working with wax does involves certain health and safety issues. It’s very important to work in a well ventilated area as not only can the fumes be quite toxic, a build-up could also ignite in the presence of a naked flame. There are also the simple logistics of working with hot wax- it is sensible to work with a pan of cold water close by in case of accidental burns. If you don’t wear glasses it is advisable to wear safety specs, or at least have an emergency eye bath in your first aid kit. Always use a fire proof surface as a base for your shellac burn. I use a recycled metal shelf, but large ceramic tiles could also be used for this purpose. Finally, working with heat guns and blow torches (with their naked flames) in a studio full of paper, I always have fire extinguisher close at hand, just in case. Your comment will appear with your name and the date it was posted. Please use text only, not website links or images. If you have not commented on our blog before, we will send you an email. Please reply to our message, to verify your email address. Please allow time for your comment to be checked and posted. 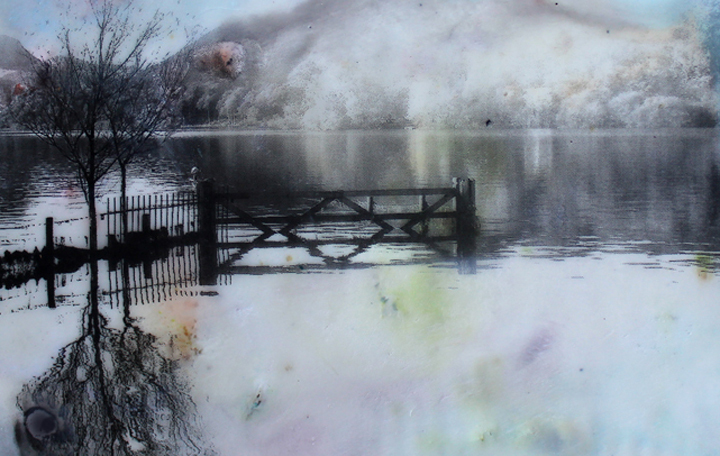 I hope you can help.I enjoy working with encaustic and collage but I really love the effect of the shellac burn. Could you tell me what shellac I should use as there are so many different types. What brand do you use and where can I purchase it in the uk? Hi Gill. I use a shellac manufactured for printmakers- Robersons Clear Shellac Varnish is a good product and is freely available over the internet. Have fun.